Visit Texascustommirrors.com homepage to browse all of our framing options. 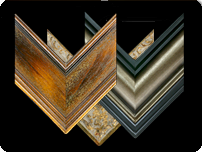 We offer numerous framing options for the perfect mirror for your home, office or commercial project. We offer natural wood mirrors, traditional frame mirrors, ornate mirrors, silver & nickel mirrors, contemporary mirrors and rustic and western mirrors. 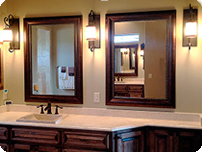 We build the most beautiful bathroom mirrors on the market today. Do you need a framed bathroom mirror? We offer hundreds of mirror in glass only or framed glass. Many companies offer bathroom mirrors in their pre-selected size. However, we build our mirrors to your exact size and with the matching frame to your decor. Do you need framed kitchen or wall mirrors? We can design, build and ship mirrors for you kitchen or bar area. 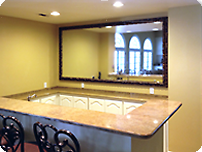 Texas Custom Mirrors can also build open wall mirrors for living room and dinning room areas. We even offer large oversized mirrors for large walls and can create mirrors up to 117” inches by 72 “ inches. We offer appointments too. Floor Mirrors can add a unique look to any room. Many customers use floor mirrors for dressing. Many times it is hard to get a very large floor mirror or a floor mirror in the best size for your room. We can make floor mirrors that are not only wide but tall, over 100 inches tall. That is the beauty of ordering from Texas Custom Mirrors, that you control the look and size of any floor mirror you need. We offer full commercial designing, delivery and installation for all commercial projects. 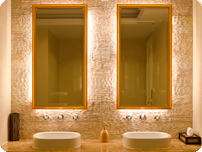 We can provide mirrors for condos, apartments, hotels, commercial buildings and residential home builders. We offer many more options that is offered on the website and can provide full design services for your next commercial project.